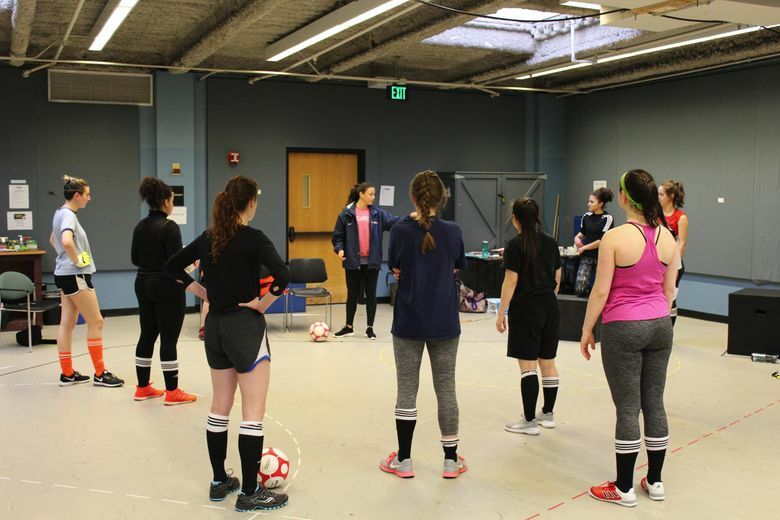 The actors in Sarah DeLappe’s Pulitzer-finalist play about a high-school girls soccer team are learning soccer moves that they'll have to replicate every performance, while also balancing dense overlapping dialogue and high-key emotions. The song can’t quite compete with the sounds of nine pairs of sneakers stamping and squeaking as the cast of ACT’s upcoming play “The Wolves” crisscrosses the space in quick bursts of speed. “Do we look like we know how to run?” asks Meme García, who plays #11 in Sarah DeLappe’s Pulitzer-finalist play about a high-school girls soccer team. All nine of the teenage girls are identified only by their jersey numbers in DeLappe’s breathlessly paced drama, set entirely on indoor soccer fields. 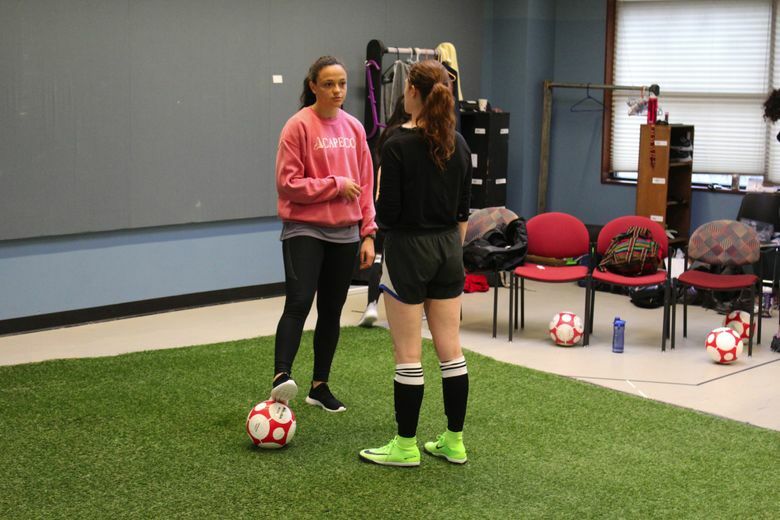 She’s asking Stephanie Ribeiro, a professional soccer player who trains with the Seattle Reign FC and who is one of the play’s soccer consultants. Running may not seem like something that needs much practice, but precision is necessary to convincingly portray accomplished athletes. It’s about “doing simple things really, really well,” director Sheila Daniels says. Not all the soccer moves are so simple though, particularly when you consider they’ll need to be replicated on stage every night. Passes back and forth between two actors can be a little tricky. A perfectly placed header or a quick shot through another actor’s legs ups the difficulty level. While Ribeiro quietly observes, Emma Bjornson (#2) asks for advice on performing a chip shot. The ball gets lofted a little too high, careening into the ceiling. “There won’t be any beams in the theater,” someone encourages her. “But there will be audience members,” Daniels says. Ribeiro offers pointers on passing and receiving, telling the actors to use the insides of their feet. They run a passing sequence again. The physical exertion is only part of the equation. DeLappe’s play is emotionally intense, too, dense with overlapping dialogue and narratively situated to maximize high-pressure moments. Every scene takes place during the warm-ups directly before a game. DeLappe’s script has a bit of an overwhelming effect at first glance. Characters’ lines veer into one another. Thoughts are fragmented, supplemented by a shared language an outsider can’t immediately grasp. Multiple columns of text indicate characters speaking at the same time. But it’s not chaotic. “It’s very similar to Shakespeare,” García said. But the language is naturalistic in its teenage cadence. These nine girls aren’t here to serve some larger narrative purpose or make a statement about youth. They’re just humans. Earlier that day, the cast had done its first full run-through, and now they were sifting through the high-key emotions. There are “hot spots” in the play where the focus of the group shifts to one person, but that’s not the whole play, Daniels said. So what’s harder? Getting comfortable with the ball or your character’s feelings? But that doesn’t mean you can forget about the ball. And that requires choreography that doesn’t look like choreography. In trying to figure that out together — and all the physical exhaustion that’s come with it — the cast has become a kind of team in its own right, Daniels says.